My first experience with United’s Personal Device Entertainment (or bring your own device) was on our way back from Zurich over Thanksgiving – well, technically it was from IAD to ORD, but you get my point. My first time using this service, I was extremely happy. The selection of movies, tv shows and other entertainment options was pretty good – as good as you would get in BusinessFirst seats and the playback was top notch, no delays or skipping whatsoever. Since November, I’ve flown three additional times where the plane had the Personal Device Entertainment (PDE) as an option. Each time, I’ve noticed it getting worse and worse. For example, this past weekend, I was coming back from Phoenix and the PDE took quite a while to get connected. None of my three devices (Samsung S6 Edge phone, iPad Mini or Motorola xyboard –yeah, I need a new Android tablet) would connect until after about 20 minutes at cruising altitude, which means we were about 40 minutes into a 3 hour flight. Once I finally got connected, the system would stop and reset every 15 or so minutes. On my other flights when I had an issue, the app was smart enough to know where I was in my film or TV show and give me the option to continue from that spot. Not so much on this flight. I had to restart the process, find the show and manually find the spot I was last watching. This was extremely frustrating, as it happened 5 times – the 5th time, I said screw it and watched a TV show on my tablet. This was my biggest concern when I first used this service – I was afraid with more people using it, we’d have technical issues. Now, I have no clue if the issues were driven by extreme use on this flight, but I do know I wasn’t the only one having these issues. Everyone in my aisle had the same issue at the exact same time. You could hear the frustrated sighs from my row and rows around me. Now don’t get me wrong, I’m here complaining about free in-flight entertainment, on a 3 hour flight, in coach. Engaging entertainment systems are so low on the priority list when it comes to air travel (safety and security are tops on my list). I really do love the idea of BYOD entertainment on United and I think it is something I’d use on every flight, if it worked. My fear is that once United works out the kinks in this system, they’ll end up charging us for the service – at which point I will not use it in the future. Have you experienced United’s Personal Device Entertainment (BYOD)? Did it work for you? Did you experience any hiccups? 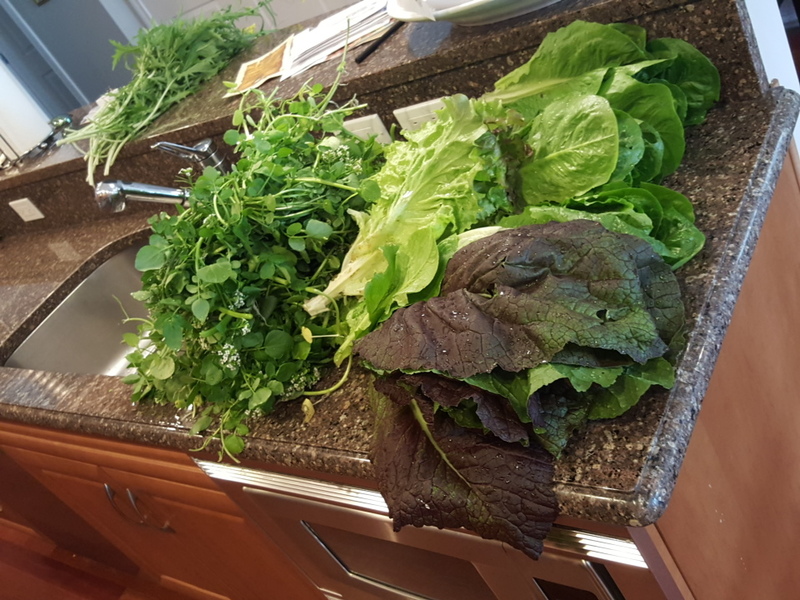 I will say that we had some pretty great success so far this year in our tiny #UrbanFarm. 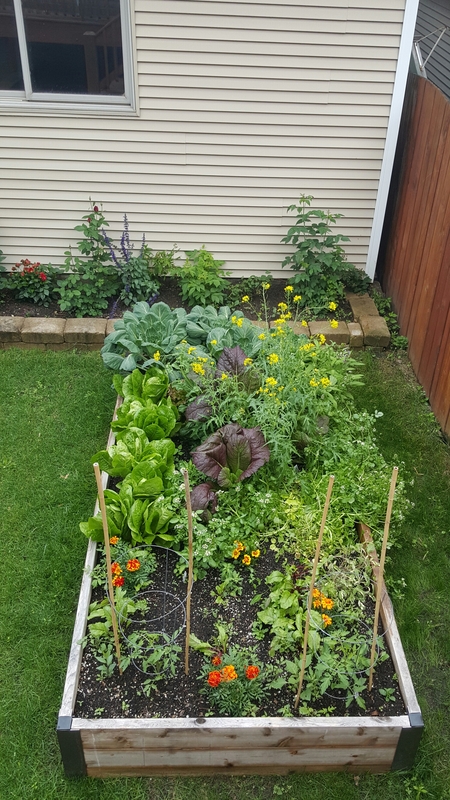 As a quick recap, a few weeks ago we planted some beets from seed and some lettuce from small starts. The beets are going a little slow, but the lettuce is making up for it.
. We harvested all of this mostly because we wanted to start planting tomatoes. It goes without saying we are eating Big Salads (like Elaine enjoys) all week. I mentioned earlier that we pulled out the blueberries because they just teased us and replaced them with small red raspberry bushes. Those bushes already have fruit and our legacy raspberries are starting to fruit too. I can’t wait to harvest these delicious little treats in a few weeks. Once we removed some lettuce (both harvesting and moving to another part of the yard) we planted a couple tomato plants, some cucumbers (two plants, which means we will have many more pickles this year! ), eggplant and some thai chilis. I haven’t planted on the upstairs balcony yet (this is where the cherry tomatoes go – in the self watering planters). I think we are planning a bit better this year. At this rate we may have a pickle party in August. How is your spring UrbanFarm working out? What are you planting? What have you harvested so far? As I noted earlier, I was in New Orleans for a big insurance conference. Whenever I have the opportunity to visit an amazing City for work, I always attempt to either arrive a few days early or stay a few days later. I want to see, eat and drink my way through these fabulous places. Business travel is not glamorous at all, so I try what I can to make it a little more exciting. We arrived on a Friday night and had just enough time to grab a beer at the hotel Bar before it was time to hit the sack. We skipped breakfast, so our first meal was mid-afternoon at the Warehouse Grill. We stopped by only because we were walking past it and we were in an utter downpour. We sat near the door and were blasted with the hot humid air from outside and freezing stream of icy air from the A/C. We each decided to have the Fried Half and Half Po Boy. This sandwich was filled half with fried oysters and half with fried shrimp. The sandwich was so dry – I ordered a double extra sauce on the side. Unfortunately, the service was so awful, I managed to get the sauce when I had about 25% of my sandwich left. I will say that that last quarter of the sandwich, smothered in sauce was pretty damn good. This was by far the worst meal we had in New Orleans. If you are caught in a rain storm, stop off here for a beer and that’s it. We had dinner at Cochon on Saturday night. Most of my friends were stopping by for lunch, so I was a little concerned that it was more of a lunch place. I loved Cochon for dinner. It was absolutely packed (which is probably why all of my late planning friends were stuck with lunch on a weekday). We started off with cocktails then moved to a Pinot Noir (if you know me, you know I love to pair a Pig with some Pinot). We ordered way too much food, including: Wood-Fired Oysters, Paneed Pork Cheeks, Macaroni and Cheese Casserole, Smoked Pork Ribs and Fried Alligator. We were stuffed, but still managed to split the Butterscotch Pudding. The service was a bit slow, but top notch, in general. I’d go back here in a heartbeat. We wandered aimlessly looking for breakfast in the Warehouse District, but found nothing open that interested us. We settled on Lüke for brunch. When we booked, we didn’t realize it was in the first floor of the Hilton. I’m glad we didn’t know this, because we likely wouldn’t have booked here had we known it. Our server was brand new and didn’t know much about the menu or even how service worked – it took us forever to get our drinks and even longer to get our food. I started off with a glass of champagne while MS had a rosé. For food, I started off with 3 oysters from various parts of the US – Washington, New England and Maryland. They showed up after our mains were served. The oysters were great – the service, not so much. We decided to split the Dungeness Crab and Tomato Salad. It was great. I am a huge fan of Dungeness Crab (see here and here). For my main I had the Fried Chicken and Biscuit (sans egg). It was excellent. I was recently introduced to Nashville’s Hot Chicken and this was along the same vein, but much better. MS had the stuffed French Toast, he really liked it, but my choice was much better. I recommended this place to several colleagues on this trip and I’d go back again. The Brennens, the prolific New Orleans Restaurant family, has always delivered quality food and service – at least in my experiences. We decided to visit their traditional New Orleans shop for our final dinner together. We arrived a few minutes early, in order to have a cocktail at the bar — the hostess almost demanded we be seated at our table, but we fought her and won. 5 minutes after our set reservation time (and 35 minutes after we arrived) we sat at our table. I started with the Turtle Soup with Sherry while MS had the soup special, which was an English Pea. We split the Gulf Shrimp and Marinated Green Tomato Salad for the next course, which was probably my least favorite thing we had on the menu. The entrees we selected were really great – MS had the Vadouvan Spiced Black Drum (a fish that we’d never heard of before) and I had the Palm Sugar Roasted Duck. Brennan’s is best known for creating the fantastic dessert, Bananas Foster. My love of history and MS’s love of dessert made this a no-brainer. The dessert was amazing and I love the ritual / pomp and circumstance of this dessert. We had a really enjoyable time at Brennen’s. The family continues to impress me with both the food, service and atmosphere. Next time you are in New Orleans, you must visit any of the Brennen’s family of restaurants. My first work meal was lunch on Monday. I had visited Emeril’s Nola on my first trip to the City in 2007. I started off with the traditional gumbo of the day, which was a little greasy, but pretty flavorful. My business hosts ordered the same thing and ate only two spoonfuls of their soup – they had never had Cajun / Creole food before. For my entree, I ordered Braised Pork Cheek Po Boy, which I thought was very tasty, but again, my hosts ate just a few bites and called it good. They were nice enough and did try food that was outside of their comfort zone, but weren’t too adventurous. The food at Nola is good and the service was a bit rushed, but I got the feeling they were trying to be respectful and get us in and out quickly since it was the lunching hour. Personally, I would have preferred a nice leisurely lunch, but that’s not necessarily what others were hoping for. We were trapped in several torrential storms during my 6 days in New Orleans and Monday night was the worst. After a few social events / happy hours / meet and greets, I was in need of some real food. We wandered around the French Quarter looking for something with character – we stumbled across Sylvain. To enter Sylvain, you must walk down a dark alley – the entrance is in an internal courtyard. We didn’t have reservations and had to wait about 30 minutes for a table — we arrived at 22h15 expecting a near zero minute wait. This place was packed. Since we had eaten lots of appetizers at the various parties earlier in the night, we decided to have a cocktail and skip straight to the entrees. I ordered the Pan Fried Pork Shoulder, with Grits, Greens and mustard jus. I was a bit surprised at how good this meal was. The restaurant had almost no room to maneuver – the tables were packed in like sardines, whenever someone excused themselves to the washroom or to leave, you were bumped. Other than that, the ambiance was great. It was a dark little restaurant, abuzz with conversation. The servers were very friendly, ensuring we always had a full cocktail or glass of wine. We never felt rushed, even though we were leaving around midnight. When we left about half the tables were still occupied – and filled with food. Sylvain was a great surprise for us. I ate a late breakfast/lunch at the hotel on Tuesday, so my only real meal out and about was dinner. Again, a business meal, we ate at SoBou (South of Bourbon). This new restaurant is on the first floor of the brand new W Hotel French Quarter. There were 6 of us at dinner this evening, one of which had began drinking earlier in the day and was in rare form. The other 4 people at dinner were great – fun and professional. We decided to split several small bites first, including: the Pork Belly Steam Buns, Yellow fin Tuna Escabeche and the Shishito Peppers. We each ordered our own entree and I selected the Ghost Pepper Glazed Smoke Pork Shoulder. Everyone had a different entree and we shared a bite from each plate. While everything was quite tasty, I think I definitely won, when it comes to the various selections. Mine was by far the best. While the food was tasty and service was pretty good, I think there are so many great places in New Orleans that are better. If someone where taking you to dinner here, don’t fight them, just go and enjoy. If you have your choice, select another restaurant on this list. Much like the day before, I had breakfast/lunch late in the morning at the hotel, so my only other meal this day was dinner. I met up with some attorneys I work with for dinner. I asked them to pick a place to eat – they are locals and I was fine with leaving the limited area of the Warehouse District, the Central Business District and the French Quarter. They started listing places that they really enjoyed — several of these places are on this list already. They then suggested a new place that had been open for just a couple of weeks. The chef from Sylvain had just left and opened his own shop. Sold! We walked from my hotel to Angeline, where Alex Harrell has hung his shingle. We were very early for a respectable dinner – we arrived at 17h45. In an effort to eat sometime close to the dinner hour, we each started off with a glass of Champagne. Our service was phenomenal, but it should be known that Alex Harrell’s wife works with my hosts this evening, so they all go way back. We found the wine list also had a surprisingly large selection of Sherry. I was the only one fully interested in Sherry, but one of my hosts really loves Port, so I managed to talk him into doing a Sherry Flight with me – one that wasn’t on the menu, but one that the bartender said she’d create and that couldn’t be missed. She delivered 5 glasses of Sherry for each of us – including the host who wasn’t a big Sherry fan. The bartender selected various types of Sherrys, going from the driest to the sweetest. The Sherrys were all served too warm and honestly, they all tasted a bit watery. I’m not saying that the bar watered their drinks, but something wasn’t like I was expecting. Perhaps the Sherrys they selected were of a different quality than I’ve tried. That being said, we finished all the Sherrys provided. We split several appetizers, including: Oyster Pan Roast, Charcuterie Board and the Mussels Verde. We each ordered our own entree as well, but we definitely didn’t need that much food, we could have split 2 entrees and been perfectly happy. I ordered the Heritage Pork Noisette and Braised Cheeks, while another ordered the Mississippi Rabbit Milanese (which was absolutely amazing – I wish I had ordered this, myself) and the final dinner companion ordered the Veal Breast. The Veal was the worst thing we tried – it was still very good, but not nearly as good as the Rabbit. I would definitely order the Pork again, assuming the Rabbit wasn’t on the menu. For a restaurant who had been open for just a couple of weeks/months by the time I arrived, I was quite impressed. I thought Chef Alex did a nice job on his new shop. I look forward to returning in the future. Hopefully you’ve made it this far into my post about my gluttonous trip to New Orleans. I didn’t realize I would spill so much digital ink writing a few lines about each of these places. The problem with New Orleans is that there are so many great restaurant options, I’m not sure I’ll make it back to any of these places – when it comes to restaurants in other Cities, I suffer from FOMO (Fear Of Missing Out) – why revisit the same place when I can try something hot and new? What are your favorite places to eat in New Orleans? Do you hit the same places repeatedly or do you try to branch out and try new restaurants? While I was otherwise preoccupied, SPG announced their summer promotion, which isn’t all that lucrative, but like I always says, any promotion is better than no promotion. The summer promotion allows you to earn 1,000 bonus Starpoints when your stay includes a weekend night. You must register by August 1, 2015 for this promotion, but Starwood has always been good about crediting back the bonus points if you failed to register for promotions before you stayed — as long as you actually register before the registration period is over. Just go register now though. Most Starwood promotions have a pretty extensive list of hotels that are not participating. This promotion doesn’t appear to fit that mold. SPG currently has 1218 properties worldwide and the details of this promotion indicate you can earn this promotion at over 1200 properties. While I can’t confirm that all locations are participating, it looks like they all are – which isn’t that surprising, since this isn’t a very lucrative promo. Here are the full terms and conditions for this promotion. I’ve said it before, and I’ll say it again. This promotion is nothing to write home about, but with the economy humming along like it is, hotel chains really have no incentive to encourage additional stays. They are filling their rooms up as it is now, why offer bonus points for stays that will just net you very little incremental revenue? In any event, I’ll take these points. Are you changing any of your hotel stays to reap the rewards? I don’t plan on changing my stays, but I did register and I’ll take those reward points if and when I make eligible stays. June 7, 2015 21:30 / 1 Comment on MIA? No, I’m not going to write about Miami International Airport (MIA). You may have wondered where I’ve been the past couple of weeks. For those of you who follow me on Twitter, Instagram and Facebook know that I’ve been busy. I hosted a few dinners, got married, went to Italy and attended an in-City conference for work at the brand new Loews Hotel Chicago (beautiful property and excellent service, by the way). I’ll be working hard to finish my New Orleans mini-trip report, start my Italy report and update you all on the promotions from my favorite hospitality providers (let’s get some more points, shall we?) – provide an update on my #UrbanFarm and anything else that was fun or interesting over the past couple of weeks.